Founded as the Louisville Jockey Club in 1874, the original Churchill Downs was built by Col. M. Lewis Clark, the grandson of the famed explorer. 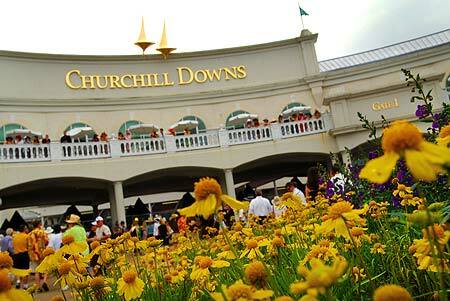 Inspired by England’s Epsom Derby, Churchill Downs hosted the first Kentucky Derby in 1875. 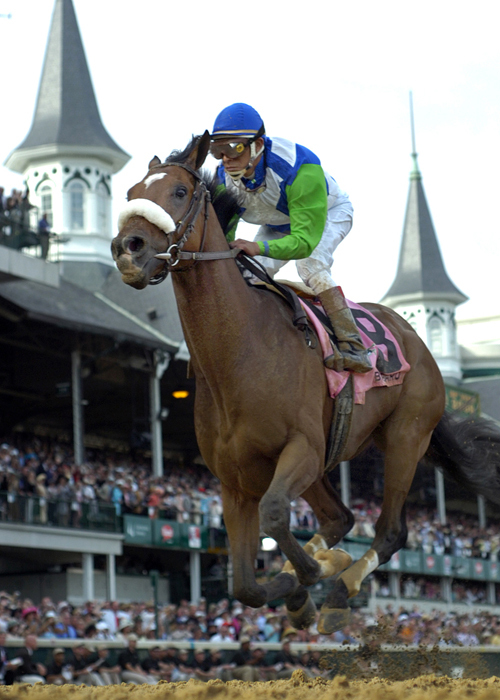 Named for the original owners of the property, Churchill Downs is known for its famous twin spires, built in 1895. In 2004, the facility underwent a $120 million modernization, replacing much of the mammoth Victorian-era grandstand with luxury suites. Seats on Millionaire’s Row cost $50,000 (and up) for a table for eight. Suites are priced at $259,000 to $305,000 for two days, including Friday’s Kentucky Oaks program. Reserved clubhouse seats (including lunch and open bar) fetch $1,776 per person (also for two days). General admission (infield, Derby day only) is $40. Of 133 Derby winners, 100 were born in Kentucky, followed by Florida (six) and Virginia (four). California has produced three Derby winners: Morvich (1922), Swaps (1955) and Decidedly (1962). This year, Bob Black Jack is the lone Cal-bred Derby starter. Three fillies have won: Regret (1915), Genuine Risk (1980) and Winning Colors (1988). This year, Eight Belles will be the first filly to start in the Derby since 1999. By color, 47 winners were bay, 43 chestnut, 17 brown, 13 dark bay or brown, nine gray or roan and four black. Roses: The oldest official Derby tradition, roses became part of the annual celebration in 1884 and have adorned every winner since 1896. In 1925, sportswriter Bill Corum dubbed the event, “Run for the Roses.” Since 1932, the winner has worn an identical garland, made up of 564 red roses (grown in Ecuador) and weighing 35 pounds. The winning rider receives his own bouquet of 60 roses. Another 2,100 roses decorate the winner’s circle. Song: “My Old Kentucky Home,” written in 1850 by Stephen Foster (who never saw Kentucky), became the Derby’s official theme song in 1921. The University of Louisville Marching Band has performed it every year since 1936 as the crowd sings along. Dan Fogelberg wrote “Run for the Roses” for the 1980 Derby. Trophy: The only solid 14-karat gold trophy in major American sports (the NBA’s O’Brien Trophy is gold plated), the Derby’s loving cup debuted in 1924 for the 50th running. Topped with an 18-karat horse, the trophy is 22 inches tall and 56 ounces. The winning owner gets one to keep. Hats: Large and often flamboyant hats have been part of the celebration since its earliest days. Zany hats dominate the infield. Mint juleps: This southern classic has been the official Derby drink for a century. About 120,000 were served at the track last year. A julep includes Kentucky bourbon whiskey (two ounces or more), sugar syrup (one tablespoon), mint and crushed ice. Produced by Libbey Glass Co., the official julep glasses, which debuted in 1938, are the No. 1 Derby collectible. Sterling silver julep cups are also popular.